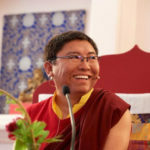 In addition to teaching at retreats and seminars around the world, Tsoknyi Rinpoche supports the Dharma, practitioners and lay people worldwide with financial help and spiritual guidance. This list represents only a small portion of his projects. May I be a guide for those who do not have a guide, a leader for those who journey, a boat for those who want to cross over, and all sorts of ships, bridges, beautiful parks for those who desire them, and light for those who need light. Inspired by Khamtrul Rinpoche VIII (Dongyu Nyima) and under the guidance of Adeu Rinpoche, a pre-eminent scholar, Tsoknyi Rinpoche gathered in one collection for the first time the major texts of the Drukpa Kagyu lineage masters. Many of these texts were on the verge of being lost or had been badly damaged. This painstaking effort, begun in 1993, has produced 108 definitive editions so far, of which 500 sets were printed. Our gratitude to Tony Duff for his effort in designing special Tibetan fonts and transcribing much of the material. These rare texts have been distributed to Drukpa Kagyu practice centers and hermitages worldwide, ensuring that these teachings will be available to future generations of Dharma practitioners. Transmissions and teachings by lineage masters are essential for the preservation and dissemination of profound oral traditions. In 2004, Tsoknyi Rinpoche organized and sponsored a two-month-long transmission of the Tsoknyi Lineage of Terton Ratna Lingpa by Adeu Rinpoche, who was the greatest living master of these teachings. This event was held in the Nangchen Region of Tibet and was attended by 900 monks and nuns. 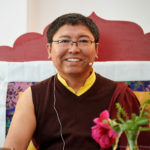 In 2005, Rinpoche organized a six-month-long special teaching by Adeu Rinpoche on the Six Yogas of Naropa for about 80 yogis from 30 practice centers and hermitages. All of these practitioners are now in three-year retreat, in training to become the future teachers of the lineage. The complete teachings of the Tsoknyi Lineage of Ratna Lingpa are being collected and edited for the first time. These will be printed for and distributed to the thousands of practitioners in this lineage. Through the International Friends of the Tsoknyi Nepal Nuns, Rinpoche continues to support the living expenses and practice necessities for many nuns in his practice centers and hermitages in Nepal and Tibet. This includes the newly established Chobar monastery in Nepal with over 100 young nuns. In Eastern Tibet, there are 2,000 nuns in more than 50 practice centers and hermitages and retreat centers. Rinpoche provides their material support and spiritual direction. Tsechu Gonpa – Tsoknyi Rinpoche helped to fund the building of a kitchen and dining hall at Tsechu Gonpa (the monastery of his late teacher, Adeu Rinpoche) and continues to provide food for the approximately 150 monks who practice there. He also helped to build the new shedra (Institute of Higher Buddhist Studies) and provides financial support for the two resident khenpos (professors of Buddhist studies). Additionally, Rinpoche provides for the material support and spiritual direction of over 900 monks in Tibet. First and Second Tsoknyi Temples – Rinpoche has recently completed the rebuilding, construction, and dedication of the First Tsoknyi Temple (the site of Tsoknyi Rinpoche the First’s enlightenment) and the historic Second Tsoknyi Temple, at his late teacher Adeu Rinpoche’s request. Lachab Gonpa – Rinpoche provides food for 30 students in shedra at Lachab Gonpa, the seat of his father, Tulku Urgyen Rinpoche. Tibetan Community of Tashi Jong – From 1997 to 2000, Rinpoche served as president of Tashi Jong, the Dharma seat of Khamtrul Rinpoche. Some of his contributions to the community were to fund the construction of 43 new rooms for about 130 monks, and three wells, providing a much needed water supply system for the surrounding lay community, serving about 500 people. Yeshe Rangsal (self-cognizant wakefulness) is Pundarika’s 55 acres of secluded retreat land in Crestone, Colorado. The Enlightenment Stupa (Jangchub Chorten) was built in 2005 at the heart of the land, and a shrine to Dorje Yudronma (protectress of the land and Dzogchen practice lineages Rinpoche holds) was completed in 2010. The Stupa is accompanied by a seasonal shrine tent completed in 2010. Construction of a multi-purpose utility building was complete mid-July 2013. Three single retreat cabins were built on the land in 2018, and a two bedroom residence near the land was also purchased for retreats. An aspiration for the future is to provide the circumstances for longer term retreats at Yeshe Rangsal. Rinpoche’s new small and lovely residence (Zimchung) is located adjacent to the retreat land. Rinpoche recently established three Dharma centers in Malaysia where he can give teachings and guide retreats. 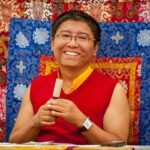 Tsoknyi Rinpoche has published two books on the way that he teaches: Fearless Simplicity and Carefree Dignity. A third book entitled Open Heart, Open Mind: Awakening the Power of Essence Love became available in April 2012. Please click here for more information about the book and how you can order it. Open Heart, Open Mind is also available through this web site’s online Store. In 2005, Rinpoche led a film expedition to the Nangchen region of Eastern Tibet. For the first time, footage of the Tsoknyi Lineage Nangchen Nuns was filmed, which led to an inspiring 28-minute DVD, Journey to Nangchen. Blessings ~ a feature-length documentary on the Nangchen Nuns of Eastern Tibet by the Pundarika Film Project and Chariot Videos was released in 2009 and is available through Chariot. In 2012, the new film, When the Iron Bird Flies: Tibetan Buddhism Arrives in the West, was released and has enjoyed a welcome reception at film festivals and other locations around the world. For more information on this new film, please visit Chariot. In 2012, an updated version of the 2007 new web site was created with the hope of offering a growing archive of teachings for Rinpoche’s students across the world. In March 2012, this web site was renamed www.tsoknyirinpoche.org and now includes upgraded social media and new features. Please click here to learn how you can help to further support Rinpoche’s projects.